In August 2009 five members of the Polperro Fishermen’s Choir met to form an “afterglow" singing group with the idea of enjoying a ‘sing along’ after the choir’s Wednesday evening practice sessions or after the choir had performed one of its many concerts. 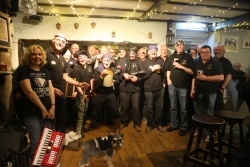 Fifteen members of the choir attended the first “afterglow” practice session and the group quickly adopted the name "Polperro Wreckers" with the first ‘Gig’ being held just prior to Christmas 2009 - so 2019 is our tenth anniversary year. The practice sessions have themselves become performances enjoyed by both visitors and locals alike singing along to a mixture of Cornish, Shanty, Folk, and Sixties numbers. The Wreckers are all about letting their hair down and having fun. They have now performed at various venues in Cornwall and Devon with charities such as the RNLI, Shelter Box, British Heart Foundation, Children's Hospice SW, Cornwall Air Ambulance and local charities including the Fishermen’s Choir benefiting as a result. At about 9.30pm on most Wednesday evenings throughout the year, the Wreckers can be found enjoying themselves in the lovely Old Mill House Inn in Polperro. This year, we plan to be 'at home' in Polperro for six of our famous free summer concerts. We have chosen Cornwall Air Ambulance and the Stroke Association as our charities for this year. The planned dates (all Wednesdays at 7.30pm) are: 3rd, 17th and 31st July; 14th and 28th August; and 4th September. The concerts will be in the open-air on Polperro Fish Quay, except for the last two which will be in Polperro Methodist Chapel. Other concerts will also be moved to the Chapel if wet.) The WRECKERS will be in the Old Millhouse Inn after each concert. The Wreckers will be on home turf (or maybe not - the Green isn't very green!) for the lovely Polperro Festival on the evening of Wednesday 19th June. There's a full programme of events for the Festival, which runs from 15th to 23th June, including music, arts and crafts, comedy - and lots of beer and fun! Based on a much older tradition, the festival was revived in 1996. The Wreckers will be singing in the Old Millhouse Inn afterwards. We are delighted to be singing at Boconnoc for Marie Curie once again. As well as live music, there will be classic cars, food and craft stalls, cream teas and of course the lovely gardens of the Boconnoc Estate to explore. Dogs on leads are welcome, especially if they like our singing. It's all included in the entrance fee of £6. It's signposted from East Taphouse on the A390 - do not follow your SatNav! This year's Fowey Festival of Arts and Music is from 10th to 18th May. The concert by Polperro Fishermen's Choir in St Saviour's Church, Polruan PL23 1PH (which is a short ferry ride across the water) will be on excellent way to round off the week. Donations to church funds will be very welcome. It's quite possible that the choir will become the Wreckers to have a beer and a bit of a sing in the Russell Inn afterwards. Rob the landlord is our concert secretary and he arranges these things! 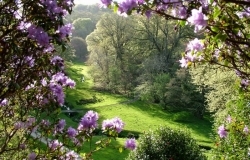 Events this month include a concert for the International Male Choral Festival in Liskeard, a performance in St Saviour's Church, Polruan, at the end of the Fowey Festival of Arts and Music, and a fun gig by the Wreckers in the lovely gardens at Boconnoc to help raise funds for Marie Curie. 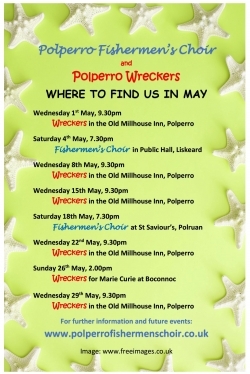 Plus, of course, the Wreckers in Polperro every Wednesday evening. There is a large version of the flyer here. Spring is sprung, the grass is riz, I wonder where the Wreckers is? Well, we be in Polperro's Mill so come yourself and see how 'tiz! We'll be in the lovely Old Millhouse Inn on Wednesday 24th April and (almost) every other Wednesday. We'll be having a sing, a laugh and beer - and we hope to see you folk here! 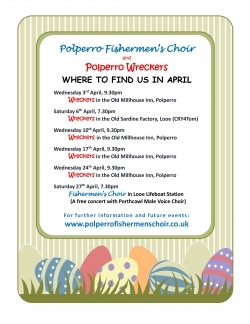 The Wreckers will be singing in our favourite pub, Polperro's lovely Old Millhouse Inn, every Wednesday during April, including Easter week. On Saturday 6th April we'll also be singing in Looe's impressive Old Sardine Factory to support Cardiac Risk in the Young (CRY) in memory of Tom Demaine. The Choir will also be in Looe on Saturday 27th April, singing in the Lifeboat Station with Porthcawl Male Choir from South Wales. Our multi-talented musical director is a published author as well! 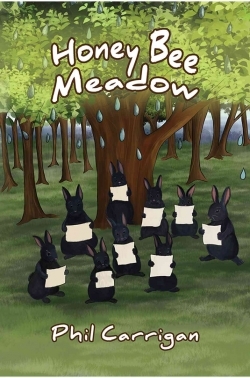 Phil's latest book, Honey Bee Meadow, is a lovely well-illustrated story involving animals in mischief and magic. Children will love it but there are plenty of good jokes and musical puns for adults too. It has lots of local colour and recognisable characters - including Polperro Fishermen's Choir and the Wreckers transformed into rather naughty singing black bunnies!